This is new notAlobby. This lobby satisfy GPL license demands and its new official client for NOTA. The new lobby is not linking unitsync.dll as previous version of the lobby did. Now, we are using own way of identifying games versions and maps. For the first look it seems that new lobby is not supporting other games/projects. It is true, but only in part. We had to choose technical solution which doesn't ruin our time-budget and at least satisfy our needs. To make it compatible with other game projects it would take much time and other resources from us. We hope you understand this decision. Of course, this does not mean we are not open for real cooperation in the future! Its sources won't be released. Let's think that "the school bus" knocked down the computer where the sources were stored. We no longer support it and no longer distribute it. We also actively remove any problematic old content - e.g. if there exist some forgotten link or version of given client (so we encourage you to contact us in case you find such thing). We hope that our future relationship will be guided by common interests and expect that there will be no big fights once we do this step. There will be removed any other technical or personal provisions blocking specifically NOTA related stuff in shared infrastructure. We also hope any member of NOTA dev project will be no longer target of extra moderation effort (that was joke). Seems good, unless there are some issues left to resolve, I see no reason why the block can't be lifted. Someone thinks that GPL is the only right and true way of living on that sinful planet. It doesn't matter what license people pick as long as no Spring engine or community project license is violated. It's not weird to prefer open source though, but that's just a preference that you don't have to share. I agree, it's extremely hypocritical, and you won't see me doing that. I don't know of any current project violating a Spring project license that isn't blocked. Good to see progress, I'd be interested to hear how your singleplayer part works. The engine devs asked to be shown evidence of the reimplementation in this post, so I guess the next thing to do is contact them privately and provide it! Silentwings wrote: The engine devs asked to be shown evidence of the reimplementation in this post, so I guess the next thing to do is contact them privately and provide it! We use own versions of maps and mods/games and only those are accepted by our lobby. Its no longer possible to play any other game with our lobby, because we do not consider any other content to be valid. All valid content is created by us and during the creation process all data normally hidden inside packed files are currently exposed to lobby in special file not part of module file. Of course opposite way the integration is not broken, our content is still Spring-valid content for any other client. Can you please host your lobby download on google drive? Your current download server is painfully slow. Is there a way to submit maps for eligibility or request to get the descriptor for the data file you need for your lobby? Forboding Angel wrote: Can you please host your lobby download on google drive? Your current download server is painfully slow. Can you tell me in which time you tried to download and what speeds you had? (so we can check the statistics). We pay not symbolic money to our provider for good speeds and if the problem was on our side, he should fix it. In Czech republic (Prague) I have speeds around 50-70Mbit/s. I would expect for US downloads its slower but not as much. smoth wrote: Is there a way to submit maps for eligibility or request to get the descriptor for the data file you need for your lobby? Currently it is possible just on interpersonal level ("you ask, we do that :)"), there is no automatic way. Our main goal was to make it work for our game. This way for example we also prevent that users of NOTA choose bad combination of maps, game versions and campaign missions. Some automatic subscription of content was in our mind (also as support for other Spring projects to provide them some universal lobby) but such thing can happen only if we see strong regular interest. Last adventure with universal client cost us a lot . As we said we are open for any co-op. Send personal message about what type of content we talk about or what kind of lobby usage you think about and we will see. Well, as it stands I am looking at getting a "final" version of all my old GRTS maps out. The idea being that I am going to move on to a new map set and style in the future. Those were all meant to "belong" as in aesthetically the same style. So I am restoring my data from an old HD right now, after that I am going to be putting out(barring odd bugs) a final version of my maps with no GRTS_ in front and updates here and there. Hopefully where i can archive the source files and move on to NEW material. What do you need from me at release for these maps? I will understand if you do not approve of them for NOTA/NOTALOBBY but I figure I am going to go through each one soon, then put a private version on my site for people to test. If you need me to include something in the maps you guys feel are good for nota, by all means tell me at the time. Just putting it out there if you need an extra config in the file or something I can add it. smoth wrote: Just putting it out there if you need an extra config in the file or something I can add it. For this case its enough to release map as you do usually (on springfiles.com or any other regular place) and ping us about its existence. If we are happy with the map for NOTA, we just take the map, unpack/read data&create config/pack it back and than put it to our distribution system. After that its ready to be used. Just btw, choice of maps for NOTA is mainly based on NOTA gameplay specifics (big map, conservative heights, proper style, proper content,...). In current distribution we want to maximize synergy of different content combinations (some pre-selection from our side was needed to avoid crazy combos which happens too often to newbie users e.g. NOTA game on 8x8 map). 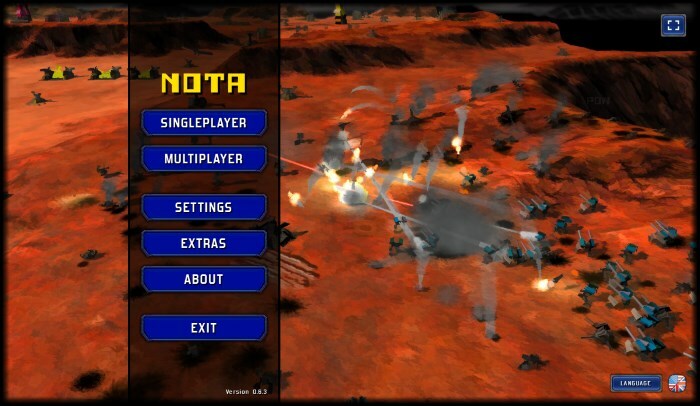 On http://nota.machys.net/downloads is an old picture with "NOTA 4.0 lobby 'Toxic'"
Bit ago I had tested version nota-0.7.2.msi, no idea how different this one is. 1) Setup nota-0.7.2.msi asks where to install. I was tricked! Basically it installed somewhere completly different then the path set in installer. Then I booted to win 7, and also got a black window. Does it maybe need flash or something? For the first look it seems that new lobby is not supporting other games/projects. It is true, but only in part. We had to choose technical solution which doesn't ruin our time-budget and at least satisfy our needs. To make it compatible with other game projects it would take much time and other resources from us. We hope you understand this decision. was needed to avoid crazy combos which happens too often to newbie users e.g. NOTA game on 8x8 map). As written for me lobby did not work but from text/pictures it looks nice. So bit sad that it does not work with all games but spring is pretty much dead anway, so understandable to take such shortcuts to get game working. I put small note about NOTA-only content on https://springrts.com/wiki/GamesDownloads because players might want to know that. Similiar I also put a note about zero-K-lobby using seperate server. Change the wording if you want to. And maybe add such short text also on https://springrts.com/wiki/Games to your game description because right now if you click NOTA then it directly goes to downloading the installer and it is not quite clear what the installer contains. So as a Linux user, I'd like to test the lobby again. How would this work? Links to obsolete OSx and Linux versions of lobby were removed to satisfy agreement with Spring community. For playing Spring on Linux contact directly authors. Note: You still can't give me GPL-infringing versions even if you send it in private. Also, 280mb? I'm guessing your installer contains a spring engine install and all the default maps/content too? It installs to Application Data too, are there problems having a separate content directory under My Games called NOTA rather than the standard Spring folder? Even with GPL, I don't believe I've seen an explanation of why it's closed source? Are you worried someone will rip off NOTA and create NOTANOTA? Are you using proprietary non-GPL confidential libraries internally that cannot be open-sourced? Is your code horrifying and you're too embarassed to show lest we think you're the spawn of Cthulu? Do you have a check that crashes the lobby with an error message alluding to expletives if you're name is Peet? gajop wrote: Note: You still can't give me GPL-infringing versions even if you send it in private. Very simple. A single instance of GPL-infringing versions proliferation may lead to Nota&lobby being permanently removed from the site, server and forums. I firmly believe pepe and danil are sincere in their will to cooperate, so the above is irrelevant. 8611z wrote: On http://nota.machys.net/downloads is an old picture with "NOTA 4.0 lobby 'Toxic'"
gajop wrote: So as a Linux user, I'd like to test the lobby again. How would this work? Obsolete image and not perfect explanation of missing linux installer/lobby adressed in https://trello.com/c/ddybaaLI/ and I hope i fixed. Gajop We ignore your toxic style of communication and I personally wonder you really need to behave like that. Anyway we hope the new statement there explains the situation better. I also remember this in 0.7.2. The path selection in that version was just a placeholder . The installer is still not perfect and this for sure is not intended. We do not use flash but we had similar issues once the there were some codecs issues with intro trailer. But i was happening in 0.7.x installers. not in 0.8.x ones. Are you sure it still happens in the latest version? Yes, but our integration issues are not just game-map, game-ai, etc related (what we described was only spring related top of iceberg). We have also notAspace setup related stuff which consist around another 25-30 params beeing in sync (map-mission-players-ai setup combos). So there is a lot of preselection which cannot be handled in mod itself. Changed to reference the download page, yes, we have the same opinion. AF wrote: Also, 280mb? I'm guessing your installer contains a spring engine install and all the default maps/content too? AF wrote: It installs to Application Data too, are there problems having a separate content directory under My Games called NOTA rather than the standard Spring folder? Lobby thing is portable but current installer is kind of strict with paths and with folder structure. So its problem of installer than lobby itself. Installer is primitive and some decisions/solutions are chosen to be able to run everything on XP-Vista-7--8-10 Win range and test lobby fast. We agree current state is not optimal. I agree, but the lobby changes a lot still (0.7.x and 0.8.x is huge audiovisual step) and we have not time for proper PR before "thing" is stable. We plan to share more but I would guess it be would primarly on our comminucation channels first. It is also connected with my next answer. AF wrote: ... I don't believe I've seen an explanation of why it's closed source? This is for longer talk but in short I can say our project is not just about the lobby. Our game content, ai framework, a lot of website stuff, internal tools, etc. etc. is open source and we share those things with other projects. The lobby is core part of integration of all other NOTA related stuff. Those things have small value alone, lobby gives them extra value by integrating them together. gajop wrote: ... Note: You still can't give me GPL-infringing versions even if you send it in private. Very simple. A single instance of GPL-infringing versions proliferation may lead to Nota&lobby being permanently removed from the site, server and forums. I firmly believe pepe and danil are sincere in their will to cooperate, so the above is irrelevant. Exactly, we have no reason to offer fake deal. We are not stupid to invest too much energy to something like this and silently distribute still the old stuff. Anyone here can follow any distribution channel we offer as normal user and figure it out himself/herself. Any trick would leak in few hours with small effort so I hope this is last time I have to answer such questions. Of course I can imagine there happens that some old stuff can be found somewhere forgotten but as I stated above we follow what we promised: full cooperation in removing this. PepeAmpere wrote: Anyway we hope the new statement there explains the situation better. I don't know how I could've phrased my questions in a nicer way. The concern is still legit: why aren't you openly providing Linux builds? PepeAmpere wrote: Gajop We ignore your toxic style of communication and I personally wonder you really need to behave like that. As always, a real pleasure talking to you. People should realize there are limits as to how badly you can talk to me after which I'll completely stop supporting any of your issues. Other people have it too, I have it for instance on my computer. So if I send this file to somebody, you will punish pepe and danil? Doesn't sound as if you have thought this through. Not saying I will do this, but I am saying it's out there already on the internet. There is no way of removing it anymore.